Ehud Olmert said that during his tenure as prime minister he had reached an agreement with the Americans for them to absorb 100,000 Palestinian refugees as part of a peace deal, adding that he struck a deal with Palestinian President Mahmoud Abbas according to which Israel would absorb "a minimal amount" of refugees. "The numbers discussed were below 20,000, but this would require and end to the conflict and a Palestinian announcement that they would not make any more demands," Olmert told a Geneva Initiative conference Sunday evening. "If we had reached an agreement, it would have changed the map of the world and the entire Middle East. We are not to blame. If there is no agreement, it's because the Palestinian side was not prepared to take the extra step that we made," Olmert said. "I suggested that the refugee issue be resolved in the framework of the Arab peace initiative. I'm glad the current government is talking about the Road Map, which states that one of the cornerstone of peace is the Arab initiative" the former prime minister said. Olmert claimed the Obama administration is not hostile towards Israel, saying, "There is no difference between (former US President George W.) Bush's positions and (Barack) Obama's positions. "Obama would have been very pleased if the proposals presented by the current (Israeli) government would have been the same as those presented by us (Olmert's government)," he said. According to the former prime minister, a solution to the Israeli-Palestinian conflict must be based on the 1967 borders. "I don’t want to address the issue of territorial exchanges. I hope it will be negotiated on soon," he said. 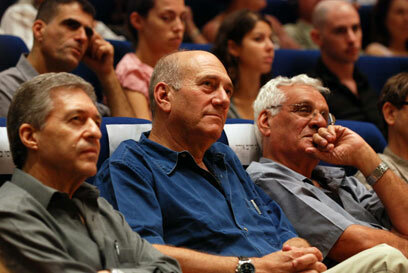 Olmert insisted that following the path he had suggested as prime minister was the only way to achieve peace. "During my final meeting with Abbas, I presented a plan, including maps." As for his plan to turn over some Arab neighborhoods in east Jerusalem to Palestinian control, Olmert said, "The holy sites (in east Jerusalem) will be controlled by five different sides. If we reach such an agreement, the world will shake with excitement. If we do not follow the path I suggested – there will be no chance for peace. "I was mayor of Jerusalem for 10 years. No one fought for its unity more than I did," he said. In response to Olmert's claim that the US had agreed to take in 100,000 Palestinian refugees as part of a solution to the conflict, a Palestinian source told Ynet that if such an agreement had been reached, it had been with the US alone. The source said disagreement had remained on the subject of refugees right to the end. "We wanted Israel to absorb hundreds of thousands, while Israel talked about absorbing far fewer," the source said, but confirmed that various countries around the world, including the US, Canada and some Scandinavian countries, had agreed to take in thousands. See all talkbacks "Olmert: US agreed to absorb 100,000 Palestinian refugees "